​It's been a while since I've written anything, and honestly enough, I hadn't been going through a lot of comics or TV shows or even movies, because the 21st Century asks of us things we sometimes cannot provide. 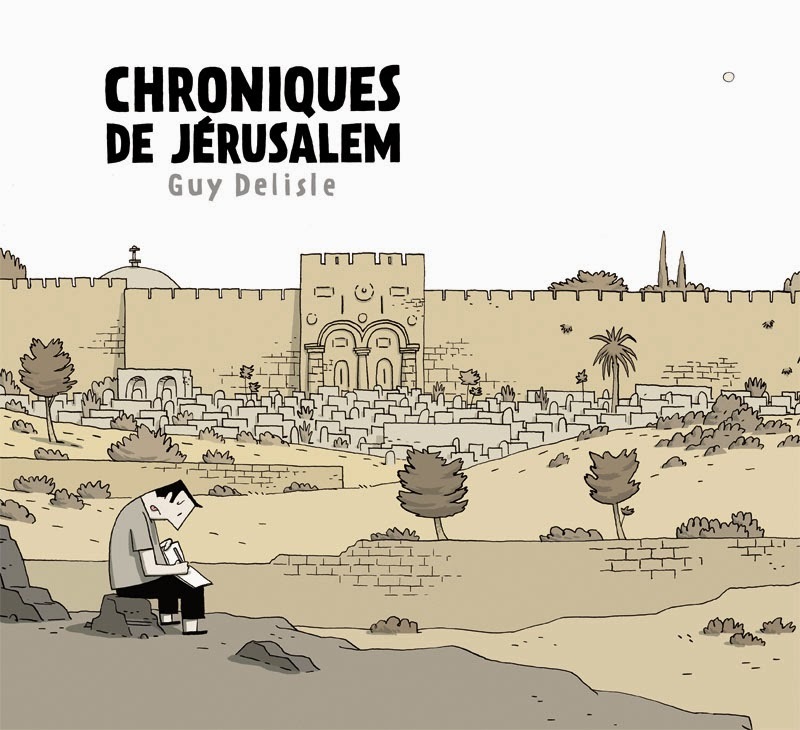 However, over the last few weeks, my schedule cleared up a bit and I had stumbled upon this great Graphic Novel authored by Guy Delisle, a Canadian born writer/cartoonist and relatively fresh new face in the genre of political/memoir graphic novels, a genre well established by the likes of Spiegelman, Satrapi and Sacco among others. Now I don't usually cover political/semi-political pieces, one reason being that I'm not very well versed in the genre, and the other being that I follow specific parts of National and International Politics and diplomacy, so in the off chance that I sound like a pretentious fuckboi, I would ask you, the readers, to forgive me. Though in all honesty, I have studied a quite a bit about Central Asian Politics over the years through documentaries, essays and one "Waltz with Bashir" but there are some parts of the politics in Jerusalem which I still have difficulty in comprehending because of the complexity of the situation there. So now you would think, "oh okay, this guy doesn't know much about what he's writing and he wants us to read this graphic novel, and he's going to pretend this is going to make us understand about a really complex issue. What an idiot." To that, I say, this graphic novel is super super lucid and easy to read, it's far from the kind of art and writing you'd find in a Joe Sacco or Marjane Satrapi novel. To restate, it is primarily a walk through, and what I mean by that is that it is writing which is similar to a travelogue but with hand drawn imagery and a lot of personal reflections and brief introspection. Now Delisle has written three other similar novels recounting his stay in Shenzhen, Pyongyang and Rangoon, and in all of them he draws himself into the novels as this average Joe trying to understand the trials and tribulations of these foreign lands, while having some difficulty comprehending his present environment, and sometimes even getting baffled by the cultural differences. In Jerusalem, Delisle delineates the account of his stay in the Holy City with his girlfriend Nadege, a member of Medicins Sans Frontieres ( Doctors without borders) working in Gaza and his two young children. Here he talks about his visits to the West Bank, Palestine and parts of Israel during the period of 2009-2010. ​​Historically Jerusalem was proposed to be separated into two individual states by the British Peel Commission of 1937 , respectively a Jewish and Arab state, with a major portion of Jerusalem to be under British Rule, but in 1947 the United Nations Partition resolution decreed that Jerusalem be a separate entity a state under international trusteeship, thus alienating itself from separate Jewish and Arab states as was proposed. However the war of 1948 caused the city to be divided, the eastern quarters were occupied by the Arabs while the western half was occupied by the Jewish. Despite being divided Israel declared Jerusalem the capital in 1967, leading to a growth in population of the city. However Jordan failed to keep the peace by breaking the Armistice agreement by destroying several synagogues, defiling the Mount of Olives, disallowing the entry to the Wailing Wall and even sniping at Jewish residents in the Old City locality. This successively led to the six day war of 1967 which saw the liberation of the eastern quarters (the Arab half) of the city, Israel rule throughout the city with the establishment of Israeli law and successive rebuilding, infrastructural development and various construction projects along the armistice lines for the next two decades. Delisle documents the nitty-gritties of the city (wow that rhymed) while going on short expeditions, shopping , taking his children to kindergarten, weekend meets with friends and fellow comic book enthusiasts and anti terrorist restrictions. He's often seen as an observer, documenting his surroundings, which are reflected in the frames, some with and some without dialogue. The entire novel is without color, the base color however changes upon movement from a major location to another. His art style is simple and clean without being all over the place, a style very similar to Herge, and known as bande dessinée. It keeps true to what comics graphic novels are as a medium, it shows the progression of story through the frames and works almost like that of a frame, letting the audience know just exactly what the scene is, and in this case, specifically, the art is not overly dramatized and the depictions aren't meant to cause extremes of emotions like most comics do, although that is a common feature of the memoir graphic novel genre. Essentially, the writing style in this novel is one of comedy, with the author stumbling upon certain sections of the city such the Arabic Christian quarters and the Samaritan minorities, which makes for a very casual read, however it isn't sardonic political humor as one would expect, it is plainly observational humor and the author's need to express his inability to understand certain esoteric characteristics of the culture of the city. In no way is it meant to be an insult or racial comment in any form. Throughout the novel he finds himself in confrontation with the physical barriers of the city, and how these physical barriers affect the people, and attributes it to the cause behind the outrage, fanaticism and intolerance. Guy Delisle is a true fan of the medium, and he constantly draws himself drawing panels and making art or writing. We see him going to universities and taking classes for students or talking about it with fellow artists. His simplistic style is one that many of his contemporaries admire and have credited him for. Essentially you would understand the same amount about the political scenario in Jerusalem from reading this graphic novel as you would from any very heavy subject matter on the same topic, which is a triumph of sorts for the graphic novel as a medium. The novel ends as effervescently as it started, but what it leaves behind is the essence of the city and its people.